Gents, hello. I as many others I think have been loitering in the wings taking note of the forum before taking the plunge and having a go. 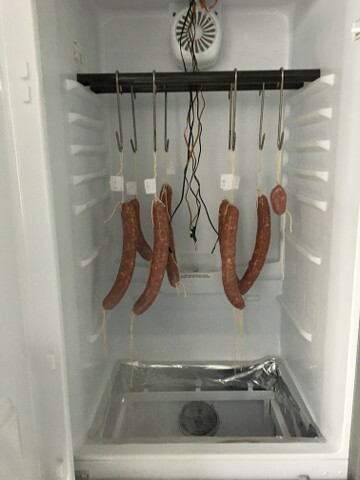 I've just started my first 'trial' batch (1.4kg of pork) of Chorizo Castellano using the 'Our Daily Brine' recipe as a guide and could do with a sanity check of how its getting on? Here is the controller. 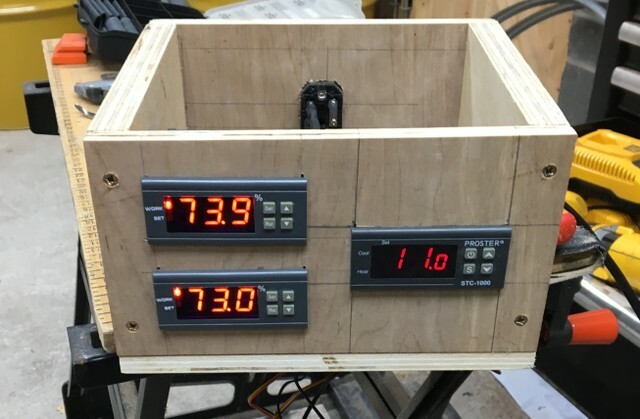 twin Hygrometer (only single outputs hence two) controlling a small humidifier and a small dehumidifier, and a single twin relay temperature controller powering the fridge and a 40W heater element. 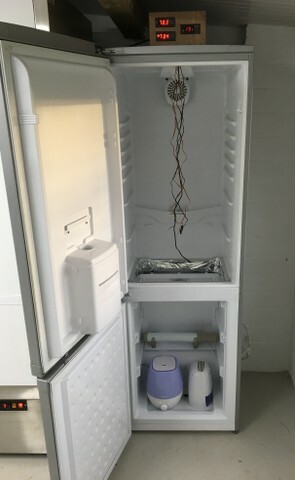 Additionally the internal fridge fan is on all the time giving a gentle air movement inside. We had a power cut on day two (figures) the chamber shut off and temp inside dropped to 7 Deg C. I then extended the fermantation to compensate. I meant to add 8 hrs to the original 72 hrs in the recipe but circumstances kicked me in the plums and it unded up being 84 hrs. Ph on testing (twice) at 84 hr point was 4.7 using a Hanna ph tester. Ive dropped the humidity and temp to 14.5 Deg C and 85% RH, dropping to 70% over the next few weeks and will dry to approx 35-40% of green weight. Is pH 4.7 ok? Ive read that pH of 5 is hard to achieve and i'm below that?! I used TSP-X at 0.1% by weight and dextrose at 0.4% by weight. The mould culture (Mould 600) was applied using a diy sprayer. I was aiming for 'gentle summer mist' and got 'deluge hose pipe'! The coverage is pretty uniform but a bit 'lush'. Should I be bothered? Welcome to the forum. A pH of 4.7 will be a bit sour to some but not a problem otherwise. The recipe has a lot of sugar for the bacteria to work on and there is also a sugar component in the pimenton that raises the total sugar even further. The pH is dependent more on the amount of sugar and on the time than on the bacteria amount. The temperature of the fermentation will effect the rate at which the pH drops. To discourage the mold I would drop the temperature to 8-10 C range. You could probably do without the fan running constantly; it more often causes problems than not. You have to start sometime and it looks like a good start to me. Keep complete records because the timeframe for making salami is longer than most peoples memory. Many thanks for the reply. I assume that if all available sugar has not been consumed the ph will continue to drop and sourness (is that even a word?!) increase? I’ll drop the temp tomorrow to 9 Deg c and hopefully the mould won’t get too much. I agree with NCPaul, but I've posted mainly to say Hi and that your chorizo looks like you've made a fantastic start. Phil, thanks for that! I’ve been wanting to do this for ages, trawling various forums and taking notes until I finally decided on what I wanted to do. Now it’s started I’m like a small kid! I must be over in my barn checking temps and humidities 5 times a day. Wish I’d made it with a glass front as I’m avoiding opening the door unless totally necessary but really want to see what’s going on!!! A glass front would be a bad move - the light can cause fats to go rancid. Opening the door's not a bad thing. It's how most of use create enough air changes in preference to a fan - fans in small spaces can be problematic. Fair point. I’ll put a switch on the internal fan tomorrow so I can run it for brief periods rather than have it on constantly. I’ll just have to get some patience! Deano, If nothing else, curing will teach you patience - that's a certainty. Try dry curing a ham; I'm looking forward to next fall. Wow, I would have gnawed my own arm of while waiting that long!! With ref to the Chorizo, the recipe calls for 35-40% weight loss which at 13-16 Deg C is estimated at 4-8 weeks. I would think that the humidity would have an effect. The lower temp will mean less water in the air at any given humidity. 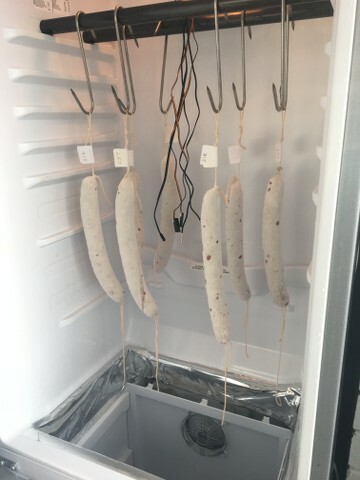 I weigh my salami weekly to follow their weigh loss and to keep an eye on them. NCPaul wrote: I weigh my salami weekly to follow their weigh loss and to keep an eye on them. Paul, do you use a hanging scale or a bowl type? I’ve only got a bowl type currently and I’ve been steadfastly not making any contact with them since they were mould sprayed and hung. This may sound stupid but will you negatively affect the mould coverage if you handle them? Obviously steadfast hygiene is required but anything else I should be doing when I weigh them? I think I’m going to have to invest in a sufficiently accurate hanging scale in the near future, any recommendations? The mold is not that delicate (know that I don't mold my salami so ymmv). I just weigh them flat on a plate. Update: stuck my nose in there this afternoon and noticed that as well as the usual scent of Pimentón was a distinct ammonia smell? I take it that’s a byproduct of the fermentation?